Summer has arrived! The days are filled with outdoor activities, lots of family time, and of course those wonderful dinners that can start with a booze cruise, and linger throughout the evening on the back porch. Being the sun is usually still up when Happy Hour begins, we like to stick to mostly cold appetizers in the summer. One of our latest favorites is the old classic, Prosciutto and Melon. I decided to jazz it up a bit though with my secret weapon – balsamic. The deep flavors of the balsamic glaze plays perfectly with the saltiness of the prosciutto and enhances the sweetness of the melon. To add some color, I placed a small leaf of arugula on some of the prosciutto & melon. Cut the cantaloupe so that you have bite-size square pieces. Drizzle a bit of balsamic glaze onto the melon. 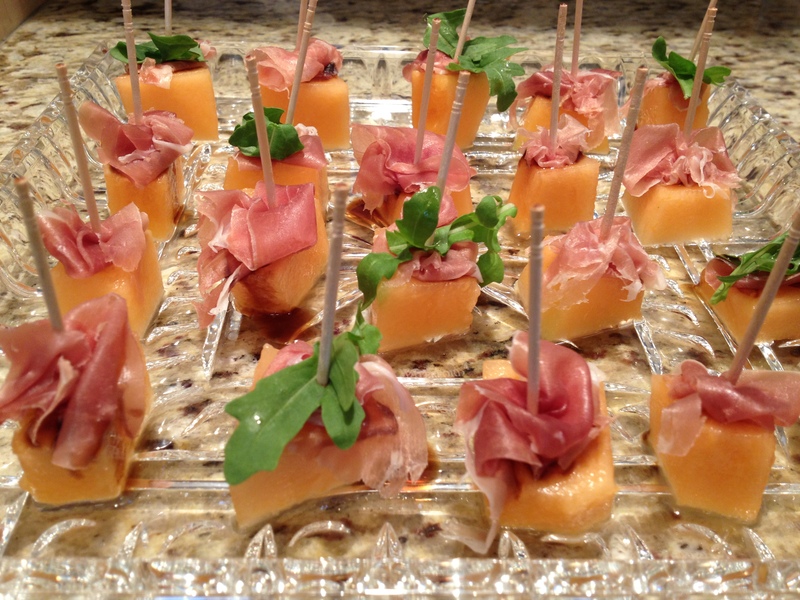 Cut the prosciutto slices into smaller pieces, and bunch a small piece on top of each melon with a toothpick. On some of the pieces, or all if you want, add a small leaf of arugula. It serves as a color contrast on the platter, but also the pepper flavor of the leaf has a nice contrast of taste with the other ingredients. Serve cold!